Conservative hard-liners in the House are using a potential government shutdown to try to force a vote on immigration. The House Freedom Caucus wants to vote on a bill that would put conservative reforms on immigration, in exchange for its members supporting a measure to fund the government. The Freedom Caucus immigration bill would fund a border wall, push for an end to chain migration and stop the visa lottery. It would also let the Justice Department withhold money from so-called sanctuary cities. The bill also includes temporary, renewable legal status for undocumented immigrants who came to the U.S. as children. The caucus' 30 members are enough to stop a Republican-only spending plan if they stick together, so House Speaker Paul Ryan needs their votes. If the government isn't funded by Friday, it shuts down. Democrats say they won't vote for any spending bill that doesn't protect immigrants brought to the U.S. illegally as children. The Justice Department says those people — who were previously protected by the Deferred Action for Childhood Arrivals program or DACA — could be deported in March. The House Freedom Caucus bill does include protections for DACA recipients, but its other proposals are likely too conservative to sway Democrats. Republicans are eager to avoid a shutdown, worried about being blamed for it during midterm elections this year. But Politico notes that past shutdowns have been pinned on the opposition party — and Democrats are the ones holding out for a DACA deal in this case. Republicans led by Speaker Ryan have proposed a short-term funding package. If Republicans can get and maintain the votes, they'll pass a stopgap bill that would keep the government going for a few weeks. But then the measure would go to the Senate — where Republicans need nine Democrats to get past a filibuster. 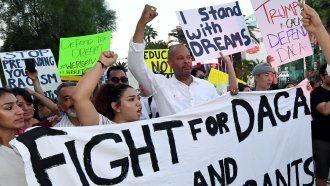 The proposal wouldn't protect DACA recipients, but Republicans are hoping a measure to fund the Children's Health Insurance Program, or CHIP, would attract enough Democratic support to pass it anyway.